The result of the UK’s referendum on EU membership and the impact it is having has been the most significant and unanticipated European political event of the last 20 years. While much is still unclear about what the outcome from negotiations will be, we can be certain of the Irish fund industry's role and determination to assist managers, irrespective of their starting point, in achieving their cross-border distribution goals. Our members are continuing to help managers and provide solutions and as Ireland has addressed needs in the funds industry successfully for more than 20 years, it will continue to do so post-Brexit. The funds industry here remains focused on its continued ability to provide seamless access to key financial services passports, as well as to assist global and regional players examine the specifics of their product, service and distribution footprints and the business models and structures which support them. Ireland remains a committed member of the European Union and will remain so, providing full market access to the EU. As Ireland is in the same time zone, English-speaking, and also has a common law legal system, it means we are well-placed to assist managers. Regardless of the direction the UK’s exit from the EU takes we will develop and enhance our relationships with UK managers. This, in turn, is likely to strengthen the Irish funds industry. With the initial shock of the UK’s exit vote now in the past, the industry has moved towards planning and action to ensure continuing access and guard against some of the possible negative impacts of Brexit. 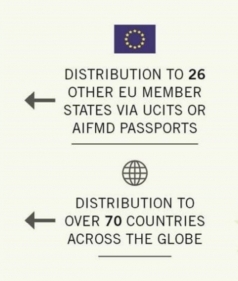 Management companies ensuring access to the EU market post-Brexit – there is significant interest in setting up Irish UCITS ManCos (where the product holds the passport), and for UK AIFMs to preserve EU marketing access by establishing Irish AIFMs, appointing Irish AIFMs or using platforms. Segregated mandate solutions under MiFID – questions have arisen surrounding potential issues where EU-based clients want to contract with EU-based providers of services. Pension funds and preserving tax transparency – there has been an increased focus on preserving tax transparency and increased queries on Irish Common Contractual Funds (CCFs). EU Insurance Regulation / Solvency II Directive – concerns have been voiced regarding the impact of more onerous liquidity requirements on how collateral is provided and if funds/funds units can play a part in a solution. Continuing on our already strong advocacy platform, we are engaging with the Irish government, the Central Bank of Ireland and agencies to keep the funds industry high on the agenda in Brexit and related discussions and to ensure that the environment and infrastructure is available to provide solutions to those who need it. Alongside our 40+ Working Groups, we have identified and have been working through positions which may arise in negotiations, engaging with EU colleagues on these matters, and developing communications and informational materials. We are regularly meeting with our members, stakeholders and peers to listen, handle queries and act responsibly. Read commentary and analysis by our member firms on Brexit and its effect on the investment funds industry. There are also publications available for viewing and downloading further below. A&L Goodbody on the post-Brexit legal environment and impacts on businesses. Read more. Brown Brothers Harriman's ongoing commentary on the implications of Brexit. Read more. Deloitte on the changing market and what Brexit means for Irish businesses. Read more. Dillon Eustace on the opportunities and challenges Brexit creates. Read more. KPMG on the risks, opportunities and the impacts associated with Brexit. Read more. Maples and Calder on the latest legal and regulatory developments on Brexit. Read more. Mason, Hayes & Curran on the impact of Brexit on the investment funds sector. Read more. Matheson on the implications of Brexit for asset managers and investment funds. Read more. McCann FitzGerald on Brexit from a legal perspective and various implications. Read more. PwC on the post-Brexit asset management environment in Ireland and the UK. Read more. William Fry looks at the key issues and Brexit planning for your business. Read more. Gayle Bowen and Elizabeth Budd (Pinsent Masons) discuss how the Central Bank of Ireland (CBI) and the UK's Financial Conduct Authority (FCA) are providing more clarity to UK-based asset managers. 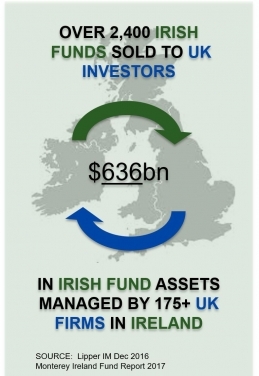 Find out more about the Irish funds industry and the scale and nature of the relationship with the UK.